If you're searching for a casual yet incredibly stylish ensemble, pair an olive crew-neck sweater with charcoal jeans. As well as very comfy, these pieces look wonderful paired together. Sporting a pair of Jessica Simpson cynessa ghillie cage pump is a simple way to add extra flair to your look. If you're hunting for a casual yet totaly stylish ensemble, make a red blazer and black ruffle tapered pants your outfit choice. As well as very comfy, these two items look wonderful together. And it's a wonder what a pair of Jessica Simpson cynessa ghillie cage pump can do for the look. If you're a fan of practicality dressing when it comes to fashion, you'll love this incredibly chic pairing of a yellow fluffy crew-neck sweater and a black and white houndstooth skater skirt. Rocking a pair of Jessica Simpson cynessa ghillie cage pump is an easy way to add extra flair to your outfit. If you're hunting for a casual yet absolutely stylish getup, try pairing a navy denim shirt with blue ripped skinny jeans. As well as very comfy, both items look incredible when worn together. 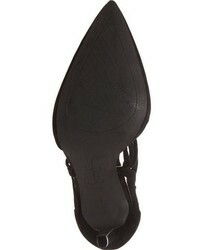 You could perhaps get a little creative when it comes to footwear and elevate your look with black suede pumps. 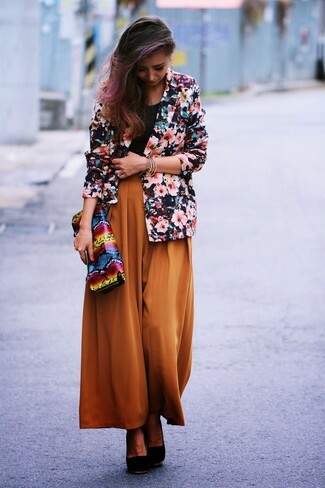 If you're on a mission for a casual yet stylish outfit, go for a navy floral blazer and tobacco wide leg pants. As well as very comfortable, both items look great together. Jessica Simpson cynessa ghillie cage pump are an easy choice here. If you're looking for a casual yet seriously stylish outfit, marry a white blazer with black leather skinny pants. Both garments are very comfy and look stunning when worn together. With shoes, go for a pair of Jessica Simpson cynessa ghillie cage pump. Wear a gold cropped sweater with a black velvet skater skirt, if you want to dress for comfort without looking like a slob. A pair of Jessica Simpson cynessa ghillie cage pump will add some real flair to this outfit. If you're scouting for a casual yet seriously chic ensemble, consider wearing a hot pink dress shirt and blue skinny jeans. As well as totally comfortable, these pieces look stunning together. When it comes to footwear, this ensemble pairs nicely with Jessica Simpson cynessa ghillie cage pump. If you're after a casual yet absolutely stylish look, try teaming a mustard cropped sweater with black dress pants. These two pieces are totally comfortable and they will also look great paired together. Take a classic approach with the footwear and opt for a pair of Jessica Simpson cynessa ghillie cage pump from Nordstrom.